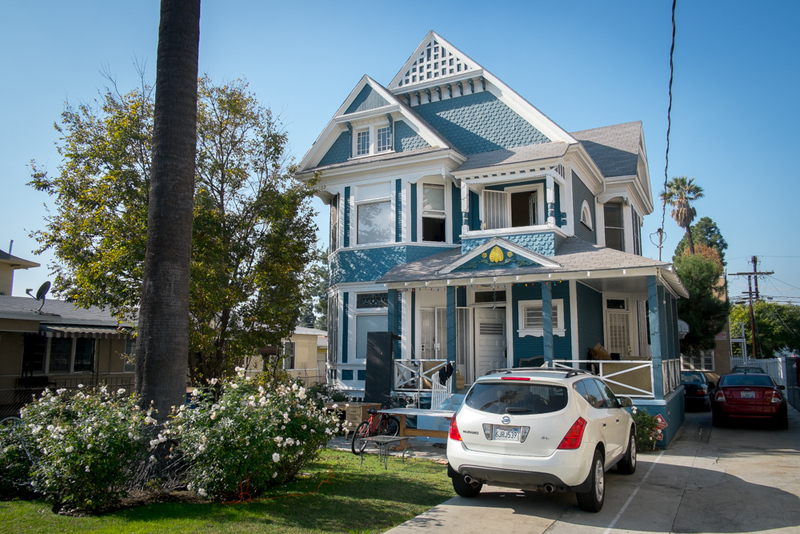 On Page 333 of the iBook, (Epilogue), we've got this 1902 Queen Anne and Shingle Style residence in Alvarado Terrace, known as the Kinney-Everhardy House; built for Abbot Kinney, the founder of Venice and Kinney Heights. 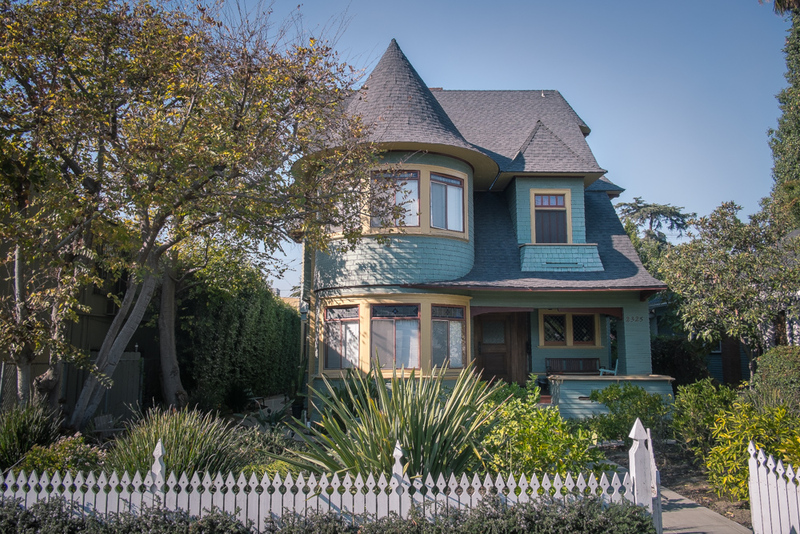 On the first page of the Epilogue is this colorful 1905 Craftsman in Angelus Vista; designed by Frank Tyler - you can see more Tylers here. The iPad Book is broken up into 11 main chapters, with each chapter focusing on a different neighborhood in the West Adams District; today we start off with the last chapter which focuses on some of the neighborhoods not seen earlier in the book. In the iBook each Chapter Heading Page contains a photo from the neighborhood, an interactive map that shows you where in West Adams the neighborhood is, links to relevant sites and a video, between 5 and 20 minutes long, where I talk about my reasons for shooting the neighborhood and give background information about the history of the homes and area. In the embedded video below are some final thoughts on the project, recorded on the last day of shooting. We end the North University Park Chapter with three photos: above, residents have created a sheltered space on an unbuilt lot. Below, a craftsman apartment building built in 1910, (though its chimneys were knocked down by the Northridge Earthquake the building itself is still occupied). Below that, a walk and run for the homeless down Hoover Street, (you can see another photo from the event here). PS: here's a bonus photo below - this was an unused image of that Craftsman Apartment above; now that I'm looking at the photo after some time has passed since it was taken am thinking it might be better for the book than the image that's currently used - more drama with that Dutch Angle! For those of you wondering just how close West Adams is to Downtown LA I submit this photo from Page 326 of the iBook; taken on Bonsallo Avenue one chilly eve. 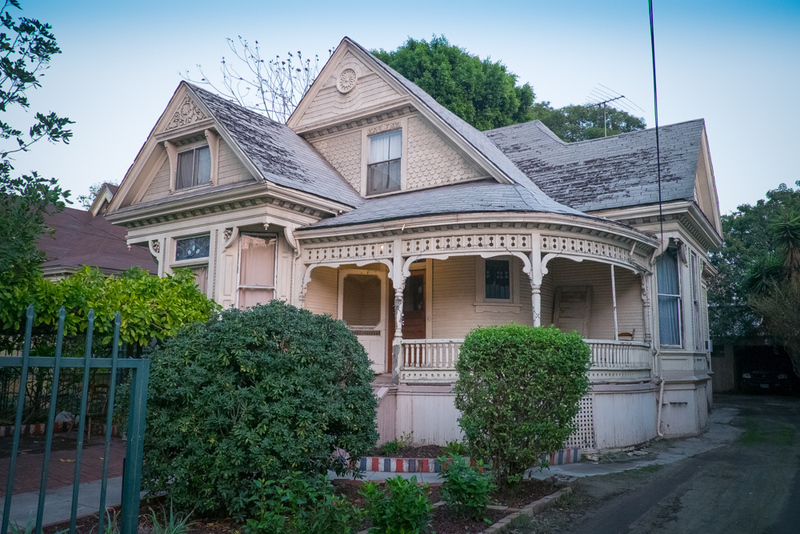 Today we've got a selection of four historic homes in North University Park - Victorians all, (the above with a hint of the Swiss), as befits the oldest neighborhood in West Adams, (contrast to the later Craftsmans in a newer neighborhood such as Country Club Park. The photo above continues the iBook tradition of including the people of West Adams in addition to the homes; above the operator of a produce truck, a common site in the North University Park neighborhood. You can see its exterior below in a photo not used in the book.